We’d love your help. 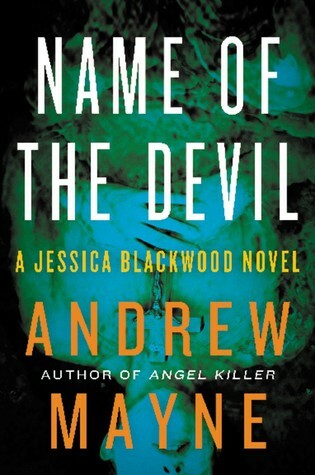 Let us know what’s wrong with this preview of Name of the Devil by Andrew Mayne. To ask other readers questions about Name of the Devil, please sign up. 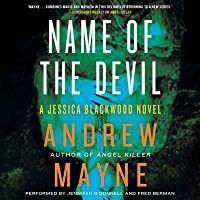 Name of the Devil is the sequel to Angel Killer (that I haven't read yet). Starting with book two is not the best perhaps, but I'm used to reading out of order and this one can easily be read without you having read the first book. Although if you are anything like me will you be dying to read the first book after you finished this book. I was, but I read book three instead, and now as I'm writing this review I'm reminded that I still have one book left to read woohoo! I found Name of the Devil t Name of the Devil is the sequel to Angel Killer (that I haven't read yet). Starting with book two is not the best perhaps, but I'm used to reading out of order and this one can easily be read without you having read the first book. Although if you are anything like me will you be dying to read the first book after you finished this book. I was, but I read book three instead, and now as I'm writing this review I'm reminded that I still have one book left to read woohoo! I found Name of the Devil to be an engrossing story about some brutal murders that seem to be the devil's work, and then more people die in more mysterious ways. Thankfully FBI has agent Jessica Blackwood ex-magician to work the case and she is soon hot on the trail of the suspect. Which would go easier if her boss was more on her side and not working against her. Second in the series, and more surefooted than the first, but just as enjoyable. First Sentence: “You know what you have to do,” said the distant voice at the other end of the phone. A church in rural Hawkton explodes, killing five people, although the bodies can’t initially be found. Lead investigator, Vonda Mitchum, would like to close the case quickly. Agent Jessica Blackwood, raised in a family of master illusionists and once one herself, has a skill for looking beyond the obvious. The further she looks, the larger becomes the scope of the case and the more dangerous; not First Sentence: “You know what you have to do,” said the distant voice at the other end of the phone. A church in rural Hawkton explodes, killing five people, although the bodies can’t initially be found. Lead investigator, Vonda Mitchum, would like to close the case quickly. Agent Jessica Blackwood, raised in a family of master illusionists and once one herself, has a skill for looking beyond the obvious. The further she looks, the larger becomes the scope of the case and the more dangerous; not just to her, but to a major figure on the world stage. Reviewing this book is a decided conundrum. There are so many really positive elements to it, yet quite a number of negative ones as well. Where to begin? There is nothing better than a book you pick up thinking you’ll only read a few pages and, before you know it, you’re 10 pages into the story. There is no question this book begins with a bang; literally. The opening is dramatic and startling with excellent descriptions… “A mansion that would have looked like a haunted house on a studio back lot if Grandfather hadn’t made sure to keep it well-coated in paint… With its pointed spires and steepled roof, the mansion was more medieval Disney than tony Beverly Hills. The character of Agent Jessica Blackwood is a particularly intriguing one. Her past enables her to observe things others may not. The people in her personal life are unusual, interesting, and often dangerous. She is a character about whom you want to know more. The plot contains a fascinating combination of science, technology and mysticism. Each is interesting and educational. The story is fragmented in places—both in terms of skips in the plot and due the layout of the text, the latter being the fault of the editor/publisher, rather than the author. It does, however, make it a bit challenging to follow, at times. The other issue is that there is a lot of reference to the previous book and its villain. Although it doesn’t impede the enjoyment of this case, it both makes one curious, yet you feel you know so much about the previous book, it takes away the impetuous to go back and read it for oneself. That said, it is rather similar to an itch which must, sooner or later, be scratched. “Name of the Devil” is very cleverly plotted with excellent twists and “wow” moments. There are some weaknesses, but nothing a stronger editor couldn’t resolve. Even so, one wants to read the next book by this author. Much like the first book in this series I was drawn in right away and my attention was held throughout its entirety. I like reading things that have a little bit of a speculative element and with the religious aspect of this book being a huge portion of the story I liked that things actually felt like it could have been biblical. While there are aspects I can't talk about because it will spoil things in the first one I can say that I enjoyed that they still tied bits and pieces to the 'Angel Kil Much like the first book in this series I was drawn in right away and my attention was held throughout its entirety. I like reading things that have a little bit of a speculative element and with the religious aspect of this book being a huge portion of the story I liked that things actually felt like it could have been biblical. While there are aspects I can't talk about because it will spoil things in the first one I can say that I enjoyed that they still tied bits and pieces to the 'Angel Killer' case. I was left unsatisfied with that ending and this shed just a little bit more light on how things may proceed. The characters stay pretty much the same and while in the first book I found Jessica to be an enjoyable narrator to follow I found myself getting frustrated in this one with how she constantly seemed to know so much more then everyone else. I felt like at every single turn she was the one stumbling upon evidence that was exactly what they needed at that given moment. Nobody else in the FBI seemed to know what was happening or how to solve anything. I'm truly confused in understanding how she had so much pull in other countries. All she had to do was Skype someone in another part of the world and they would just tell her she was beautiful and bow to her every wish. I used to know a magician. He did mostly tableside card and magic tricks at chain restaurants, but he fascinated me. He’d do a trick over and over, every time I asked, and I could never figure out how the hell he got that card into my ice cube (he always bought me a fresh drink afterwards) or how my earring ended up in his ear and his in mine (which is a little gross now that I’m thinking of it all these years later). His standard response, every time I asked “How did you DO that?” was simply, “ I used to know a magician. He did mostly tableside card and magic tricks at chain restaurants, but he fascinated me. He’d do a trick over and over, every time I asked, and I could never figure out how the hell he got that card into my ice cube (he always bought me a fresh drink afterwards) or how my earring ended up in his ear and his in mine (which is a little gross now that I’m thinking of it all these years later). His standard response, every time I asked “How did you DO that?” was simply, “Magic.” I really had no choice but to believe him. I love Andrew Mayne's books; devilishly twisted plots, and really clever storylines. Refreshingly different compared to so many other writers. This book was just as satisfactory as The Naturist and Jessica Blackwood's Book 1. I really look forward to the 3rd Jessica Backwood being available on Kindle. I wasn’t quite as taken with this second book. Parts of the plot just seemed too much - too out there. And yet, the kernel is not only sound, but inventive and terrific. I’m just not certain about the execution… Second-book syndrome? Jessica seems to be too much of a lone-wolf. How is she the Only One who can see past the obvious? She’s got a team working with her and that she works with, and yet, she still ends up solo, fighting for her life. Ailes isn’t in this book as much. I can’t decide if that’s good or bad. We learn the event that made Jessica literally walk away from magic and her family in one fell swoop. But the narrative of her first real fear takes pages and chapters to unravel. The payoff is good, but I’m not sure if it’s worth the time it took to get there. The Author is obviously very cynical about religion and faith, which makes a certain amount of sense given that he’s a magician. Some of Jessica’s experiences seem to come straight from his memory banks, such as those where Jessica and her family are accused of sorcery and black magic by some who call themselves “devout”. I’d never given that much thought before. I grew up in a faith-based family, but I’ve faced evil and “witchcraft” in my life; I’d never confuse magic as entertainment for that. But it’s interesting to me how many people probably haven’t; and so many have had negative experiences with religion and those in religious authority. There’s such a hunger for all things supernatural. And as the Author points out subtly, demons and supernatural beings are commonly woven into games, books, movies, and other mediums. Which makes the subject of possession and demons in this book all the more fascinating. But the mystery and the supernatural aspect gets lost - and practically obliterated - in the mire of opinion, FBI politics, and action. At a certain point, I forgot why the “name of the devil” was important to the story. The pieces of the story were so scattered and disconnected at that point… so much action had already taken place, that reconnecting back to the original event was difficult. Even Jessica’s conviction that a particular High Level Religious Figure was the next target didn’t necessarily bring it all together for me. Probably because having that person present at the past event just seemed… presumptuous. Then again, I don’t know anything about that person’s history or predilections, so it’s entirely plausible. It just felt… off to me. Is it a good story? Absolutely! But it takes so long to get where we’re going, and there are so many pieces that don’t necessarily fit until late in the story. Jessica literally fights her way through the book, and I felt a bit exhausted on her behalf. While I admire her sense of justice, I found her just a tad unlikable in this book. She came off as somewhat smug and superior. It felt as if she bullied her way through people, procedure, and common sense, because She Alone was capable of figuring it all out and stopping it. This review has been hidden because it contains spoilers. To view it, click here. Pure Brilliance. These Jessica Blackwood novels are magic on pages. Jessica herself is a brilliant, completely unique creation, as are these books. The author's deep knowledge of many disciplines is staggering. The FBI, magic, the human psyche, politics. It goes on and on. These books themselves are so SMART. As well as jaw-droppingly fascinating, entertaining, illuminating. And, these books are so SMART. Truly some of the best books, in any genre, I have ever read. One disappointment. Mr. Maybe Pure Brilliance. One disappointment. Mr. Maybe rushed his endings. Suddenly events escalate, you turn a page, and on an unusually ambiguous note, the book is suddenly just... over. There are some very unsatisfying conclusions (meant to bring the books to a quick end, but they don't really END. They just... stop. It must be purposeful, as a writer this cognizant of detail wouldn't suddenly simply abandon his story unless it was fully intended. He brings these stunningly fascinating books to unsatisfying endings for SOME good reason, I'm sure, I just have no idea what it might be. This review has been hidden because it contains spoilers. To view it, click here. The major problem with this disappointing follow up is that it bulges with MacGuffins. Problems arise and are just resolved arbitrarily and with little sensible explanation. Jessica's holed up in an impossible position, surrounded by an army trying to kill her. How will she get out of it? Ah yes, the mysterious, all powerful boyfriend will just show up and chop off their heads. A reverend blows his brains out on live TV, and leaves behind a tape that suggests something awful happened in his past. The major problem with this disappointing follow up is that it bulges with MacGuffins. Problems arise and are just resolved arbitrarily and with little sensible explanation. A reverend blows his brains out on live TV, and leaves behind a tape that suggests something awful happened in his past. What awful thing? How can we recreate an entire scene from audio? Oh, it's cool, the FBI have a clever machine that can detect the tiny sound of a child's ribcage being crushed, and where the people in the room are standing whilst watching it. And on and on. How does clever Jessica solve it? Well, she doesn't. The boyfriend does. Seems he knew what was going on all along. Which kinda makes me wish I could read his story, since he's got all the answers. Reading thrillers and crime writing is a little like experiencing a magic trick and then having the secret revealed. There's a puzzle, and you enjoy watching the detective work backwards to piece it all together. The lure of this series is to see even more magical and impossible murders solved by a magic expert and thereby get some insight into the mind of a magician. I really enjoy the Jessica Blackwood novels. Andrew Mayne writes clever stories about a female protagonist, FBI Agent Jessica Blackwood. Blackwood uses her upbringing in a 'magical' family to solve her cases. Not the Harry Potter kind of magic but the illusionist and slight of hand. This knowledge really doesn't solve the case but gives her a keen sense of being able to think things through with a different rational than the average FBI agent. She's not always right, and sometimes shes a little I really enjoy the Jessica Blackwood novels. Andrew Mayne writes clever stories about a female protagonist, FBI Agent Jessica Blackwood. Blackwood uses her upbringing in a 'magical' family to solve her cases. Not the Harry Potter kind of magic but the illusionist and slight of hand. This knowledge really doesn't solve the case but gives her a keen sense of being able to think things through with a different rational than the average FBI agent. She's not always right, and sometimes shes a little late, but she is human, which I like about her. Name of the Devil follows her through a case which she doesn't exactly solve, but through the help of an ex-boyfriend, she sees through to the end. The ex seems to come through with the right answers and sometimes leaves her wondering what it is he actually does. For anyone with severe withdrawal from Stieg Larsson and his series featuring Lisbeth Salander, you will find a commensurate bad-a## heroine in Jessica Blackwood, the protagonist in "Name of the Devil". I was introduced to Andrew Mayne with "The Naturalist." Mayne has written novels into four series and several additional books. While I enjoyed "The Naturalist," I really enjoyed "Name of the Devil." And like the protagonist in "The Naturalist," Jessica is a socially awkward but intellectually gi For anyone with severe withdrawal from Stieg Larsson and his series featuring Lisbeth Salander, you will find a commensurate bad-a## heroine in Jessica Blackwood, the protagonist in "Name of the Devil". I was introduced to Andrew Mayne with "The Naturalist." Mayne has written novels into four series and several additional books. While I enjoyed "The Naturalist," I really enjoyed "Name of the Devil." And like the protagonist in "The Naturalist," Jessica is a socially awkward but intellectually gifted FBI agent who gained fame in the first book in the series which I have not yet read. Jessica had an unorthodox upbringing raised by her father, uncle and grandfather, all who had professions as magicians. It may sound hokie but this brings a really fun dimension to the way Jessica perceives the world as well as some of her talents. "Name of the Devil" finds Jessica in Appalachia where she is investigating the bizarre disappearance of residents from the town church. Jessica is back at work going through her day like normal until a crime happens that is decidedly abnormal and she is called in to be the out of the box thinker. Jessica does just that, sort of stepping on toes in the process. I hate others think Jessica is out for glory, she isn’t, she just wants to find the bad guy and punish them. I think by the end those closest to her realize that, not sure others will see it that way though. I liked that with this book we got to see more of Jessica’s past Jessica is back at work going through her day like normal until a crime happens that is decidedly abnormal and she is called in to be the out of the box thinker. Jessica does just that, sort of stepping on toes in the process. I hate others think Jessica is out for glory, she isn’t, she just wants to find the bad guy and punish them. I think by the end those closest to her realize that, not sure others will see it that way though. I liked that with this book we got to see more of Jessica’s past and how it formed her. I thought it telling how far Jessica’s family went when she was threatened, that maybe they cared about her more than she thought. Seeing Jessica and her grandfather interact was interesting. The crimes and bad guy in this one was crazy. So many strings connecting everything. I’m not sure how I feel about the ending. Sure the bad guy was punished, but I don’t know that ALL the bad guys were punished. I read this book as part of my Kindle Unlimited membership. I would like to thank the author for partnering with KU so I have access to this book. Unfortunately, the first book of the series is not available through KU. There are references throughout the book to our heroine, Jessica Blackwood's, past but not so much that a new reader can't read this as a stand alone book. Sometimes, however, you do find yourself exactly what is going on in Jessica's head. This is truly an international intrigue. Right down to refuge in an embassy. There is magic here indeed. How an author can get me to try one more outing of Jessica and her family - both personal and professional. SPOILER: There are a few people we don't know what happened. Good thing all but the first book appear to be be KU. I hope the next book reveals the answers. Well once I read one by the author I am on a spree to read all his works. I like the easy way he writes and with magic and people of magic involved, I am loving it. A church is blown apart and the congregation is found outside the blast perimeter and it all starts from there. A bit confusing - things like who is Black nick and what was his role? There were pointers to the ‘warlock’ and I for once thought there might be a connection. Maybe the author wanted to keep all options open for another nov Well once I read one by the author I am on a spree to read all his works. I like the easy way he writes and with magic and people of magic involved, I am loving it. A church is blown apart and the congregation is found outside the blast perimeter and it all starts from there. A bit confusing - things like who is Black nick and what was his role? There were pointers to the ‘warlock’ and I for once thought there might be a connection. Maybe the author wanted to keep all options open for another novel. This was like layer upon layer of more powerful people controlling the system totally. One man who is a mystery is Damien. He is the real God. Knows almost everything. The book started off slow and dragging and didn't pick up till halfway through. That was when things started to fall in place and became interesting. The ending was also a bit rushed and disappointing, especially with all that build-up. I've read a couple of Mayne's books and I've enjoyed every single one of them, with the exception of this. I just felt like Jessica was becoming this impossibly fantastic Lone Wolf hero--how could she be the only one who could get anything done in the FBI? Why wa The book started off slow and dragging and didn't pick up till halfway through. That was when things started to fall in place and became interesting. The ending was also a bit rushed and disappointing, especially with all that build-up. I've read a couple of Mayne's books and I've enjoyed every single one of them, with the exception of this. I just felt like Jessica was becoming this impossibly fantastic Lone Wolf hero--how could she be the only one who could get anything done in the FBI? Why was she handling so much responsibility with almost no oversight? Fiction involves a suspension of reality but this was just somewhat illogical for me. I'm really enjoying this series, including the complexities of Jessica's feelings toward Damian, despite the rational part of me knowing that this kind of romanticizing of the "bad boy" archetype — see any old-school capital-R Romance novel from the last century for more examples — contributes to normalizing unhealthy real-world relationships in our culture. Bottom line, I guess: Great fictional fun, but don't try this at home. When I first read this book a few years ago, I was at a job I hated. Every day, I'd carefully pack this book along with a water bottle for the day. I relished breaks, as I quickly grew engrossed in each new chapter. I worked closely with file clerks who carefully placed reams of paper into my do-this box throughout the day. One file clerk was quite playful, and as a little joke, would silently walk in, then slam a big pile of papers in the box. It always made my office mate and I jump a little, When I first read this book a few years ago, I was at a job I hated. Every day, I'd carefully pack this book along with a water bottle for the day. I relished breaks, as I quickly grew engrossed in each new chapter. I worked closely with file clerks who carefully placed reams of paper into my do-this box throughout the day. One file clerk was quite playful, and as a little joke, would silently walk in, then slam a big pile of papers in the box. It always made my office mate and I jump a little, then chuckle and say hi. I was absorbed in an action-packed passage where Jessica is being her normal badass self, when SLAM, and I jumped a mile in the air as I shrieked, "And someone just was shot in the book!" The file clerk couldn't help but grin, surprised. "Really?" "Yes," I hissed, setting the book down to paw through papers. Another gripping read by Andrew Mayne. I hadn't read the first novel in the series, but I was able to jump in and read this one without any trouble. These books are pretty well written and the character is interesting enough but my problems with the series are 1) the crimes are ludicrously overblown - akin to the plots of James Bond films and 2) the criminals and her former lover Damian are even more over the top. These people are harder to kill than Jason Bourne and richer and more ingenious than Bruce Wayne. There's not much narrative tension when you know superman is always going to save the day. I really liked the first book in this series, but the murder and subsequent investigation in this just didn't grab me. I couldn't get into it, and the story just didn't keep my attention. I still like the character of Jessica, and I would try another book in the series, because I feel like it was the location and specifics of this murder investigation that didn't work for me. A different murder in a different place might hit me quite differently. Oh, No, Not The Pope! Mr. Mayne seems to have done it again. This is Jessica Blackwood in her second FBI adventure and she is proving to be quite the plucky little gumshoe as she takes on a case with demons, spontaneous human combustion, and a precocious plot to plant the Pope. Will the former magician pull a rabbit out of a hat to save the day? "Wherever you want me to be."